Ernie Boggs, was known as Lightfoot, started his martial arts training in 1970 at a YMCA in St. Albans, West Virginia. 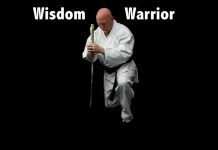 Under the guidance of karate master, Bob Long and later the influence of jujitsu legend, Professor Wally Jay and martial arts great, Graciela Casillas. 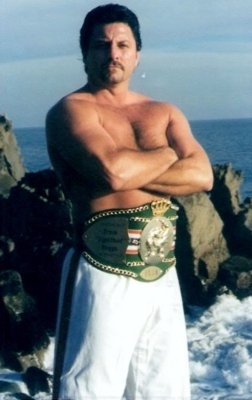 From traditional martial arts training at the local YMCA to point tournaments (before sparring pads were invented), to body guarding and under ground fighting, to magazine covers and changing martial arts competition around the world, Ernie Boggs has evolved into an influential martial artist. Ernie Boggs was considered one of the great sport jujitsu players. He was one of the first American’s to become World Champion in that sport as well as the only person to receive the AAU Jujitsu All-American Award. He also competed on the national and international circuit, excelling in traditional karate and professional kickboxing. After retiring from competition, Ernie Boggs utilized his 35 years of martial arts experience and skill in coaching the USA Sport Jujitsu Team. As the coach of Team USA, he helped produce many national and world champions in his sport. In his commitment and desire to promote Sport Jujitsu throughout the world, he was instrumental in establishing the International Sport Jujitsu Association (ISJA). He served as ISJA chairman. He was considered one of the world’s leading authorities on Sport Jujitsu. Ernie Boggs created the first piece of sparring equipment designed specifically for mixed martial arts competition, the sport jujitsu glove. His glove looks similar to a boxing glove while the hand is closed but when it is open the fingers are free to permit grappling. 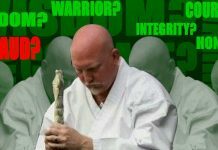 Ernie Boggs produced the first video series on sport jujitsu with Pioneer Interstate (Tiger Claw) and has another 7-tape video series, Sport Jujitsu from the Ring to the Street available through Unique Publications. Ernie Boggs was a founding member of the United States Sport Jujitsu Association (USSJA) and was credited for helping promote the first mixed martial arts competition (sport jujitsu) on an organized level in the United States. He wrote the rulebook for the ISJA that more than 25 countries now follow as the official guidelines of sport jujitsu competition. Ernie Boggs hosted the 1996 ISJA Sport Jujitsu World Championships bringing 17 countries together in South Charleston, West Virginia. By the mid 1990’s there were over 1,200 competitors in sport jujitsu competition and the sport had finally arrived as a legitimate international sport. At this event it was proven that sport jujitsu is the most realistic means of testing your martial arts fighting skill in a safe manner. Over 5,000 matches and no (zero) serious injuries is a very good safety record for any sport. Through the training and guidance of Ernie Boggs, the USA Team came away with the Gold Medal in team competition for the first time. As a martial artist, Ernie Boggs traveled around the world teaching, competing and training in more than 24 countries. Mr. Boggs specialized in teaching Defensive Tactics and Combatives for law enforcement as well as the United States military. As a certified defensive tactics expert, Boggs was world renowned for his close quarter weapon disarms and retention. He worked with members of police agencies across the country as well as in Argentina and South Africa. When he wasn’t traveling conducting seminars or coaching Team USA, Boggs was teaching and producing some of the most well rounded martial artist. His school was affiliated with schools in more than 20 countries and had students on five continents. Ernie Boggs’ had a passion for working with kids, especially at-risk-youth. He worked with kids from many different backgrounds ranging from the rich and famous to potential gang bangers. He believes poverty plays a huge roll in creating at-risk-youth, he also believes just because a kid may be rich doesn’t mean he can’t be an at-risk-youth. Ernie Boggs’ program, “Problem – Solution – Change” has made significant gains in enriching the lives of at-risk-youth who may have other wise become lost to today’s society.